EA Group Limited supply, install and maintain Automatic Barriers (often referred to as security barriers, traffic barriers or car park barriers) to many different facilities and commercial businesses. Our automatic barrier clients do vary, but typically our customers include car parks, businesses, industrial estates, facility management, police forces, airports, construction companies, building contractors, farms, quarry’s, clubs, local government, schools and hospitals. We work alongside our customers (and their agents which often include architects, specifiers, property agents and facilities management companies) to establish their specific aspirations, requirements for the type of automatic barriers that they would like. Our own survey team will visit any site or facility and carry out a proper site survey including all safety requirements to offer a complete automatic barrier solution. We have been established since 1985 as the preferred automatic barrier installer and we have expanded ever since encompassing all types of barriers for many different uses from security and traffic control, to safety barriers and car park revenue systems. All of our clients are very important to us and we pride ourselves on our professional workmanship and all of our automatic barrier installations. We are specialists, and our portfolio of clients range from the a single entry/exit automatic barrier protecting a few parking spaces to huge multiple site integrated revenue systems. Our team of engineers have years of automatic barrier installation experience that will ensure your project is installed as it should be; safe, secure and on budget. By having automatic barriers fitted, you are increasing your security and protecting your property. EA Group’s years of experience and expertise will ensure that your automatic security barrier will be planned and installed correctly, on-time and on budget by professional engineers who will ensure that it is secure, safe and any risks eliminated. There used to be occasions when the potential disruption and financial cost of getting a mains 240 volt power supply to the position of an intended automatic barrier was prohibitive. Projects used to be abandon because the cost of getting the mains power supply to the location was multiple times the cost of the barrier itself. But not anymore. EA Group have a complete solar powered automated barrier solution that will turn those abandon projects very much back to a reality. Our new solar powered barriers offer up to 950 operations per day with an integral battery back up, with all the safety features that you would expect with a standard mains powered automated barrier. And then of course there are the green credentials. Harnessing the suns renewable energy to power the automatic barriers reduces your operating costs and helps to reduce your carbon footprint. Our solar powered barriers are very ‘green’, but you can have them in any colour that you wish! It is our company reputation that has ensured our name has been passed on numerous times as the company to speak to for automatic barrier installation and service. You may well have arrived here on our website from someone that has referred us to you. Even if you already have automatic barriers fitted to your property by another automatic barrier company but would prefer a higher level of security, response and service, please get in contact with us as we would be delighted to service and maintain your existing electric gates. 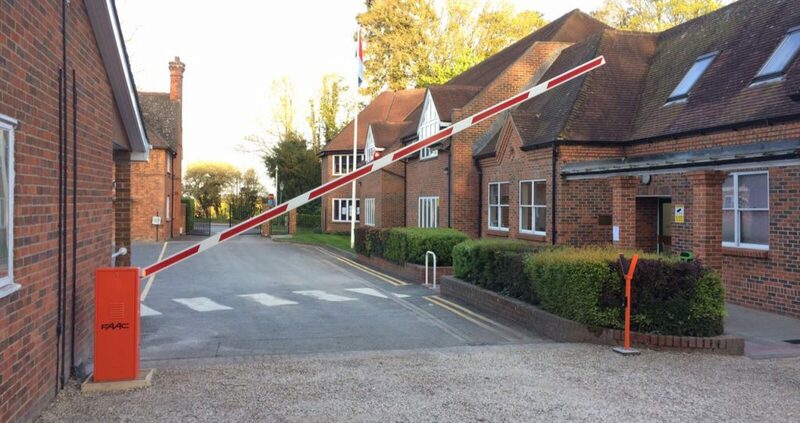 We can install all types of automatic barriers, traffic barriers or security barriers at different lengths or sizes, and we have a barrier to fit all budgets and applications. As the automatic barrier specialists, we are your automatic choice to install, repair or maintain your automatic barriers to a high standard ensuring that they are safe, reliable and problem free. These being the main automatic barrier manufacturers we know, and trust. If you are considering having automatic barriers installed, or if you wish to have your existing barrier repaired or serviced, please contact us for a friendly, no obligation chat and to arrange for an engineer to survey and offer a competitive quotation.